Chef Raimund Hofmeister's kitchen at Atelier de Culinaire is like any other, hot and fast paced. His sous chefs are his students and don't have anywhere near the experience he does, but his expectations are still that of a five-star restaurant. "I do not want to have an excuse 'Oh well, students did that.' I demand the best," he said. 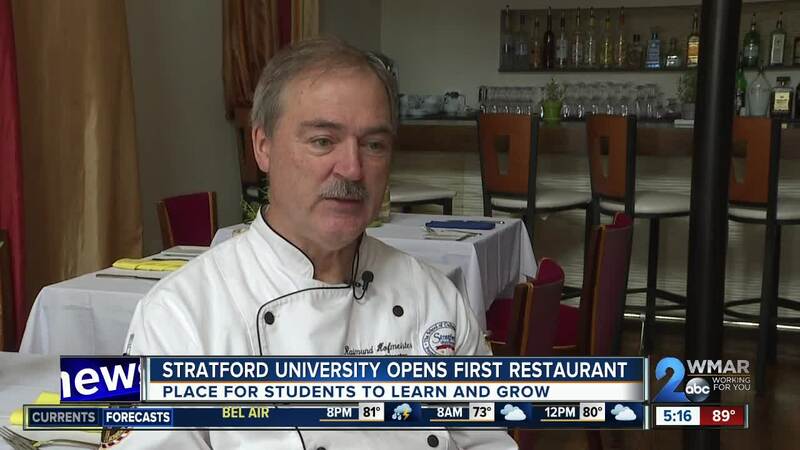 Hofmeister is the director of Stratford University's Culinary Arts and Hospitality Management program. He has an extensive background in the culinary industry, working in restaurants all over the country and world. In addition to running the Culinary and Hospitality program, he's also running the school's new and first restaurant, Atelier de Culinaire, located in Baltimore's Little Italy neighborhood. "The 'atelier' means the artist's workshop. So the 'Atelier de Culinaire' means the cook's workshop," Hofmeister said. Students in the Culinary and Hospitality program will work the front and back of the house, cooking and serving dishes with influences from around the world, like Italian, French and Persian. "I really feel the more hands-on you have, the better your product or your student is going to be," he said. Students who are doing their internships and close to graduating will make up most of the staff but any student in the program is allowed to come help out. First-year student Aryeon Pommells is focusing on baking and pastries but says she is excited to work at Atelier de Culinaire. "I learned how to skin a fish and I have never done anything with a fish before, ever. They give you a variety of things to learn even if you're not in the culinary field," she said. The restaurant is likely the only one around that asks its customers to offer their staff a new job while they dine. It's even written on the menu. "They're looking for jobs and here we are showcasing. It should be the window to our program." Atelier de Culinaire is running a grand opening special through August 3, a three-course dinner for $25. The restaurant is only open for dinner and may do a lunch service down the road. It is also starting a Sunday brunch on August 12. To make a reservation, call 410-528-2710. The restaurant is opened Wednesday-Saturday, 6 p.m. to 10 p.m.